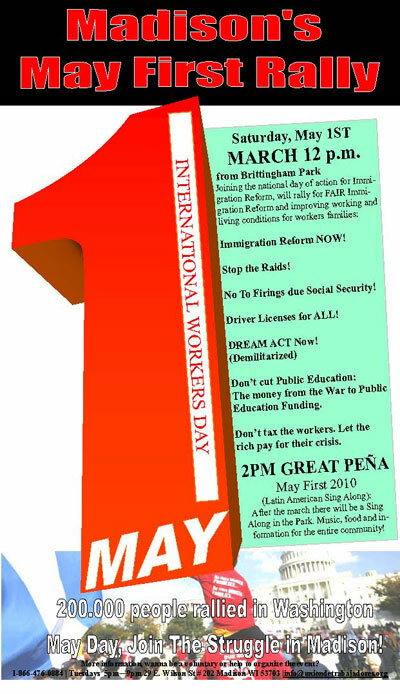 Cities across the country are organizing marches, rallies, socials and more for May Day 2010. Atlanta, New York City, Buffalo, Detroit, Chicago, Madison, Milwaukee, Minneapolis, St. Louis, Memphis, Dallas, Los Angeles, Portland, Maine and Portland, Oregon are some of the cities already organizing planning meetings and working to develop broad unity in action. A main aim of the work is strengthening the fighting unity of all the organized forces standing for rights. Many are building on the work for the March 20 and 21 actions in DC, strengthening their working relations and support among the people. Everywhere organizers are standing up for rights — the rights of workers, whether working or unemployed, the rights of immigrants whether documented or undocumented, the youth and their right to education, the right to healthcare and an end to dividing families, and more. The demand to Stop the Raids and Deportations, Legalization Now! is widespread as is All for One and One for All! Below are reports from organizers providing some representative examples of actions planned. United Methodist Women (UMW) is very excited to announce a march and vigil for Immigrant...Civil...Human Rights on Saturday, May 1 in Kiener Plaza, downtown St. Louis, 11:30 - 1:30. This takes place in conjunction with the UMW Quadrennial Assembly. 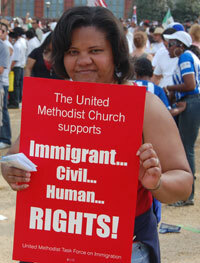 Thousands of United Methodist Women attending the Assembly and key St. Louis community groups will march from America's Center to Kiener Plaza and participate in a public faith-based vigil for immigrant, civil and human rights. In collaboration with local organizations like Missouri Immigrant and Refugee Advocates, Interfaith Committee on Latin America, National Farm Worker Ministry, Metropolitan Congregations United, Organization of Black Struggle, the Organization of Chinese Americans- St. Louis and African Mutual Alliance Assistance Association of Missouri, United Methodist Women will be joined by Nobel Peace Prize winner Rigoberta Menchú and interfaith leaders from the Muslim, Jewish and Catholic faiths. The march and vigil will be a call to the St. Louis area and to the United States to keep families together, bring an end to detentions and deportations, protect workers' rights, stop racial profiling, and show support of just immigration reform. Marchers will leave America's Center at 11:30 am. The noon vigil at Kiener Plaza will include interfaith prayer, puppetista street theater and music. I invite you to spread the word about this event to your contacts in the St. Louis area. Please encourage them to organize a contingent and invite others! • Close Inhumane Detention Centers for Immigrant Families! We Demand Immigration Reform — President Barack Obama was elected to the presidency with 70 percent of the Latino Vote. Mr. Obama promised that if elected, he would approve a pro-immigrant Immigration Reform in 2009. The current situation is not adequate for immigrant families and the needs of our economy. STOP Home Foreclosures, Evictions & Utility Shutoffs! Help Promote May Day! We march for all. We march for immigrant and workers rights. We demand: Good Jobs! Just Legalization Now! No More Deportations! Driver’s Card! No Legalization, No Reelection! 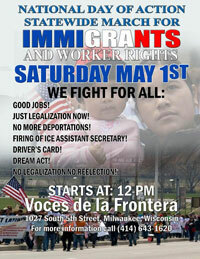 For the last three years Voces de la Frontera has organized one of the largest May 1 Marches in the country. Help us continue that tradition this year. We have 30,000 fliers in our office and they need to be distributed. Help distribute them in your churches, schools and soccer leagues! Immigrant rights activists from across Texas are organizing for a May Day March. Texas contends with the militarization of the border, mass detention camps and government raids terrorizing communities. Like many cities, Dallas had a large march in 2006 when workers took action to block a bill in Congress that would criminalize all undocumented immigrants. Now they are demanding that President Obama and the Democratic majority in Congress pass just immigration reform and do it now. As one activist put it "We are tired of mañana, (tomorrow). We want immigration reform now." Another echoed his sentiments, saying, "Let’s send a message to Barack Obama, to Congress, that the time for comprehensive immigration reform is today — and not next year or the year after," he said. The march is expected to start at Santuario de Guadalupe Cathedral and end at Dallas City Hall. Actions in San Antonio and Brownsvile, Texas are also taking place. 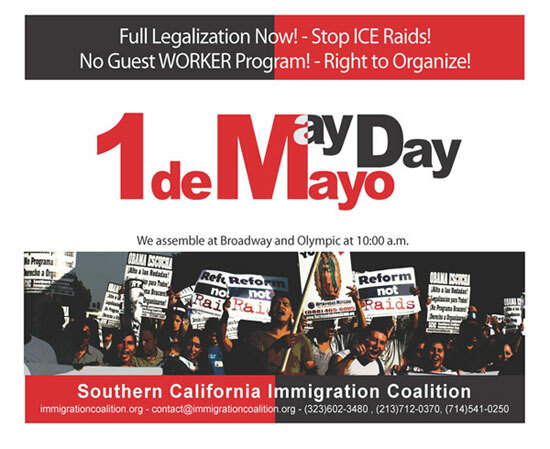 Union del Barrio in Oxnard, as part of regional actions being organized to commemorate International Workers’ Day and to demand the End to the Immigration Customs and Enforcement Raids, Stop Separation of Families, and Legalization for All, is organizing a 10K Barrio Walk. Participants of the walk will be raising funds that will immediately support the family of Liliana Santuario, a migrant worker mujer (woman) that has been in sanctuary for over 2 1/2 years, separated from her family, her husband and three children. Please join us! If you want to walk with us on May Day, we ask that you raise funds to contribute to Liliana’s family. Raise $1, raise $5, raise more! 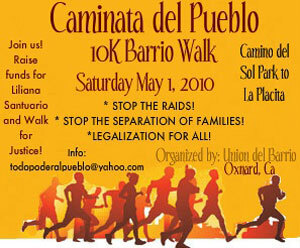 Take a stand against the brutal immigration policies of state terror implemented against the Mexican/Latino community. ¡Somos un pueblo! Sin Fronteras! We are one people, Without Borders! On May 1, 2010, the Boston May Day Committee is organizing a March and Rally starting on Boston Common at 12 noon. It will be joined by a procession from Boston’s North End featuring large cut-out images of the 8 immigrant workers known as the May Day Martyrs. In the Common, we are proud to announce a special performance of the famous radical theater group Bread and Puppets and a series of speakers that will address the major demands for May Day. • The Obama Administration is escalating the wars in the Middle East with record casualties in Afghanistan and Pakistan. • Obama has supported the immigration proposal of Schumer (D) - Graham (R), which we flatly reject as repressive and guest worker oriented. Full Rights & Citizenship for the Undocumented! Tax the Rich! Fund Schools, Clinics & Communities! Fund Human Needs Not War & Occupation! Solidarity Across Borders, Down with Washington’s Orders!